Although the word fritada means fried or fry up in Spanish, the word afritada in the Philippine vernacular usually refers to a dish with a tomato based sauce. 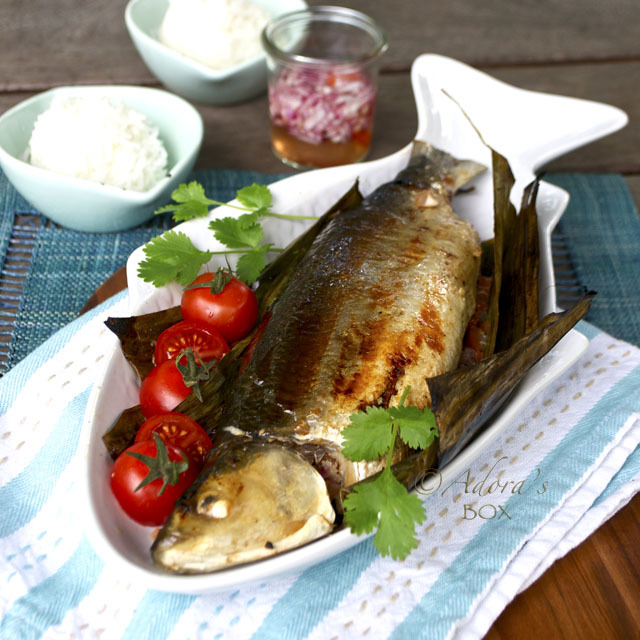 The meat or fish is fried before being added to the sauce. 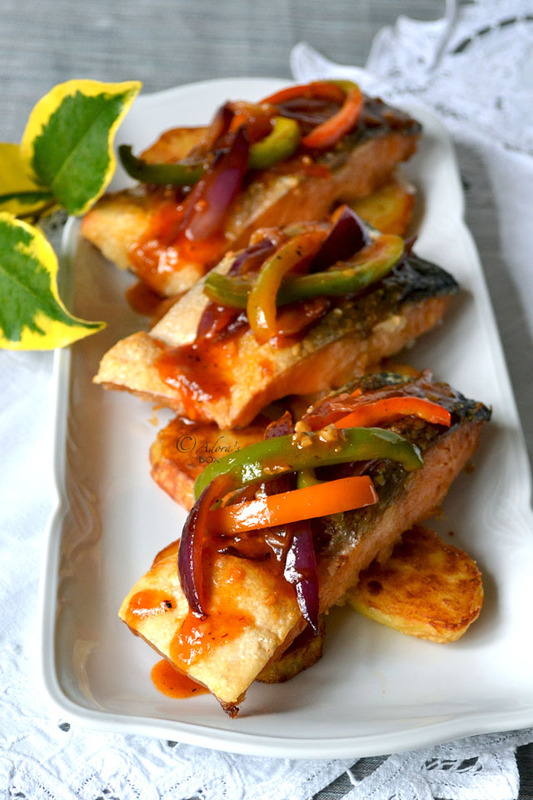 The salmon fillets in this afritada are first fried before being before being added to a tangy tomato based sauce with sweet peppers and saffron. 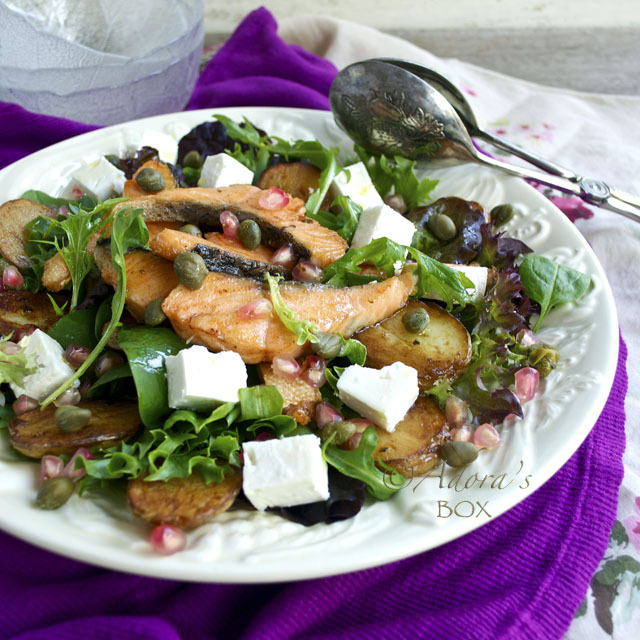 A bed of fried potatoes complete the dish. I made this recipe for the Kulinarya Cooking Club's theme for the month which is Filipino aphrodisiac food. Salmon and all oily fish (as well as shellfish), chilli peppers and saffron all stimulate the appetite for food and sexual desires. 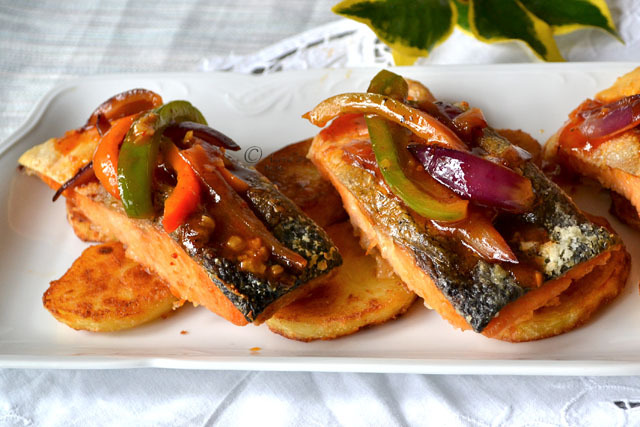 I can't vouch for its effectivity but I can certainly assure you that it is a really flavourful, tasty and moreish dish that you would want to cook again and again. Season the salmon with the salt and black pepper. You can cut the fillets in halves (like I did here) to make smaller portions if you are serving this with other dishes. Heat the oil in a frying pan and pan fry the salmon fillets, skin side down first, until cooked. In a clean pan, saute the garlic in olive oil, then add the onions and cook until translucent. Add the tomato puree, brown sugar, fish sauce, sherry and vinegar. Bring to the boil and simmer for 2 minutes. Add the rest of the ingredients and simmer until the peppers are done. They should still have some crunch. Take off the heat. Add the salmon to the sauce. 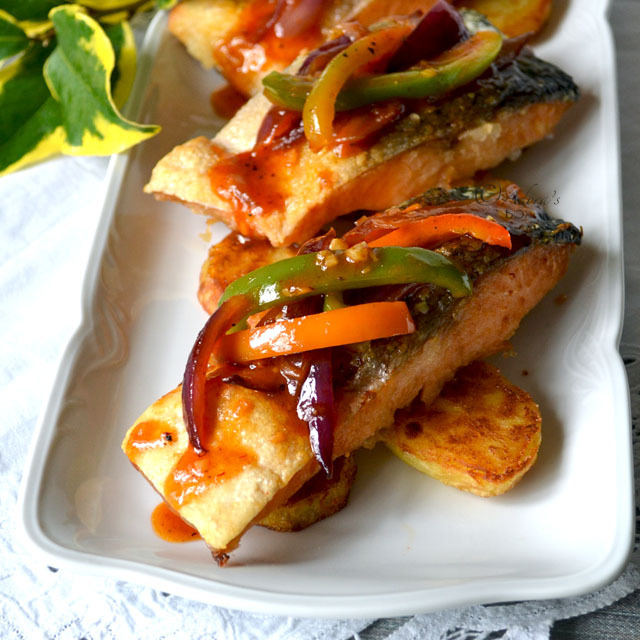 Arrange the potato slices on a serving dish and top with the salmon and the sauce. 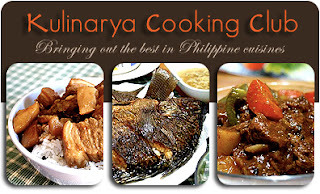 This post is for the KULINARYA COOKING CLUB theme for February 2011: Filipino Aphridisiac Food. Hi A! Guess we both posted way ahead of the deadline! This is a delicious alternative to my usual salmon repertoire. Hey Adora! Mom always cooked chicken, beef, and sometimes pork afritada but I haven't tried Fish. It looks rich and delicious! I still have to come up with mine for the theme. Thanks for sharing. That loks lovely. I am loving this recipe. This is awesome It has always been Pork or Chicken Afritada... will definitely try this one. I love salmon...tapos ni-afritada pa...sarap! I love afritada and I haven't tried cooking any other meat besides chicken with afritada.. I'll give this a try! 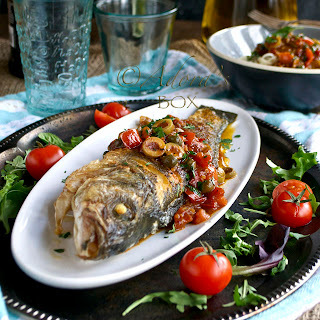 I haven't thought of using fish in afritada before but your version looks so delicious that I might just have to give it a try!